Compare and shop for an all natural loose powder or... find out how safe your makeup is with our product ingredient reviews. Many commercial face powders can contain a variety of toxic and potentially harmful ingredients which may result in eye and skin irritations, allergic reactions and skin rashes ... Some ingredients are even known to cause cancer or other serious health conditions! Treat yourself right and avoid the toxins! Set your makeup for a silky smooth look with a natural face finishing powder! This sheer Mineral Finishing Veil has the perfect translucent finish for an airbrushed appearance. It's light-weight and offers outstanding setting properties, as well as oil absorbing, while being free of talc and perfume. Use an organic or natural face powder to set your makeup and give a silky, iridescent finish! Mainstream powder products commonly contain talc, which is carcinogenic when inhaled. Prolonged inhalation of talc can cause inflammation of the lungs, bronchial irritation and the development of fibrous lesions. Other toxic ingredients include formaldehyde (carcinogenic and a sensitizer), quaternium-15 (can release formaldehyde), lanolin (irritant), imidazolidinyl urea (irritant, can release formaldehyde), MEA, TEA and DEA (hormone disrupters, can release formaldehyde) and parabens (hormone disrupters, irritants). How Safe Is Your Face Powder? 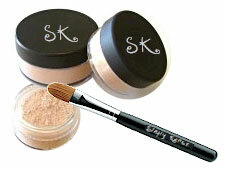 Keep it simple and safe with all Natural Face Finishing Powder Products and look and feel fabulous! Choose Organic, All Natural Beauty Cosmetics Makeup Products because you ARE worth it!